There are a lot of colors to choose from that are not yet pictured, so if you have something in mind, please let me know. 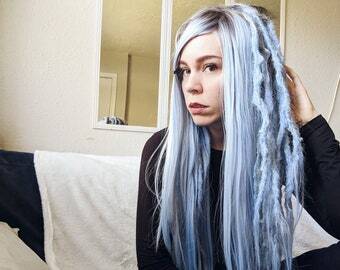 Just put your hair up, put this wig on, and you will have beautiful dreadlocks instantly. It is on a base that matches the hair color and is elastic throughout to allow for a really good fit. Comes with clips sewn in. Your choice of fringe/loose hair, or bangs. This wig is made from high heat kanekalon, so it can be styled with heating tools. Dread lengths vary with the wig, but some to about 18-22", dread thickness is 1/3 to 1/2 inch, and can be made thinner or thicker to your preference. Gift will be wrapped in colored issue paper with a gift card and envelope included. Brown Periwinkle Ombre Dreadlock Wig. Front lace full Wig. Instant Dreadlock extensions. Synthetic high quality fiber. Handmade to order. I feel like I should have ordered double but that's a fault on my end. They're beautiful. Quality craftsmanship and a very helpful seller! Will definitely shop here again! Reinstall whenever you like, usually three months is a good time because of new hair growth. Use your normal shampoo, focus on the roots. Wash as often as you like. Do not use styling iron on extensions. You can use a blow dryer on low. Between installations, dip them in freshly boiled water. For high heat Kanekalon, no hot water, palm roll. These are completely custom and made to order, so whatever lengths, thicknesses, and colors you would like are up to you! For the best match, please send pics of your hair color in natural bright light, but not direct sunlight and I will help match it. It takes 3-5 business days for most custom orders to be made. Take a small section of your hair where you would like the dread to be. Split in two. Half of the section of hair will be used to braid down the extension, the other half to wrap around and cover the braid. Clip aside wrap section. Slide the dread up to the top of braid section until it is against your scalp. Separate the braid section into two sections. Braid your hair down the dread using the dread as the third strand. When you run out of hair use a tiny rubber band to secure it. Now use wrap section to wrap down dread and cover braid installation, then also secure with tiny rubber band. You can also cornrow your hair and weave these in. Or you can just braid them in if you don't mind the braid showing. Cut the loop at the top of the dreadlock extension. Place the extension about two inches up the bulk of your own dread. Use a small crochet hook to pull the loose extension hair into your dreadlock. Keep pulling the extensions hair into your dreadlock from all sides until all the extension hair is fastened inside your dreadlock. Sew through the bulk of the extension and your dreadlock with matching thread to secure. Sewing is going to make the difference. Dread wig. Front lace full Dreadlock Wig. Dreadlock extensions. Synthetic dreads. Dreadlocks. Made to order. Your color and length choice. Custom Dreadlock Wig. Dread wig. Full wig. Dreadlock extensions. Synthetic dreads. Synthetic dreadlocks. Made to order dreadlock wig. Red Dreadlock Wig. Dread wig. Full wig. Dreadlock extensions. Synthetic dreads. Synthetic dreadlocks. 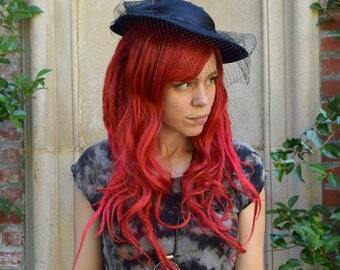 Red Synthetic dreadlock wig. Purple Dreadlock Wig. Dread wig. Full wig. Dreadlock extensions. Synthetic dreads. Synthetic dreadlocks. 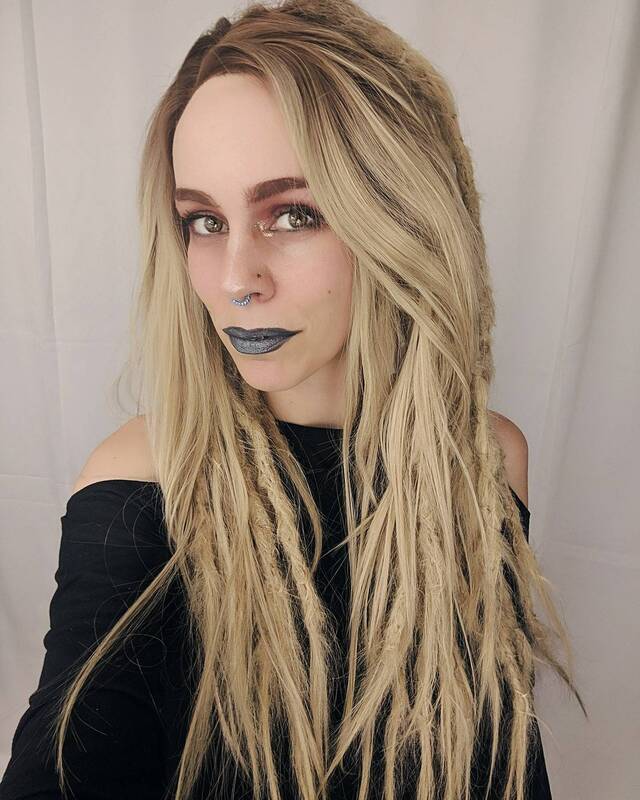 Perwinkle Synthetic dreadlock wig. 5 DE Blonde ombre synthetic dreads. Dread Extensions, Synthetic dreads, dreadlock extensions, dreadlocks, dreads, ready to ship, 16-20"